José Lerma, El Pendejo, 2011, installation at Galerie Loock/Wohnmaschine, Berlin, Germany. RALEIGH, NC.- CAM Raleighs latest feature exhibition, The Credentialist, a new body of artworks commissioned by CAM Raleigh and created by José Lerma, opened May 19, 2012. José Lerma currently lives and works in New York and Chicago, where he is a faculty member at the School of the Art Institute of Chicago. Lerma creates intricate installations that combine painting and non-traditional materials such as reflective fabrics and commercial carpet, relying on a compendium of mediums, references, and elements that combine his personal history and extensive academic accolades with his awareness of social history. Lerma originally migrated from Spain to Puerto Rico and now lives between Chicago and Brooklyn, and has multiple degrees in law and art. The Credentialist is a new body of 18 artworks commissioned for the main gallery at CAM Raleigh highlighting his ability to combine and collapse facets of history from his personal viewpoint. Central to the exhibition is the notion of rising and falling, particularly the precipitous demise of great historical figures. The records of these fluctuations are played out on various paintings, curtains, and carpets that occupy the space. 4 large canvases, which imitate ballpoint pen doodle, depict themes such as war, love, and paradise while referencing paintings on the subject by Tintoretto and Piero De La Francesca. In his paintings, Lerma employs images of Baroque style portraits of historical, famous French Bankers from the 18th Century, which are signified by wigged portraits. The artworks in this exhibition are monumental, featuring a liberal use of brush strokes, doodles, and highlights of paint to underscore the sketch-like quality of the drawings. By distorting and often erasing the features of the faces, only leaving profiles or frontal views of wigs, Lermas work also references the paintings of Francis Bacon and Philip Guston. Lerma places his large works on electronic keyboards as a way of combining previous elements of his oeuvre. This provides a soundtrack to each painting -- making the paintings active participants in the art. Through the use of acrylic spray paint on canvas, he is able to reproduce the aesthetic of highlighters and penscratchings on a paperpad. His swirled scribbles are reminiscent of graffiti while doodles reference French political cartoon drawings. Lermas paintings meld these several diverse mediums to create works that resemble portraits of bureaucratic figures while simultaneously appearing to be topographical landscapes. Lerma builds up hues of paint and juxtaposes them alongside flat planes of white paint or doodles of spray paint. Lermas paintings are experimental and expand the notion of painting. The main gallery of CAM Raleigh features a large-scale carpet installation. Lerma paints directly on inexpensive commercial grade carpets. 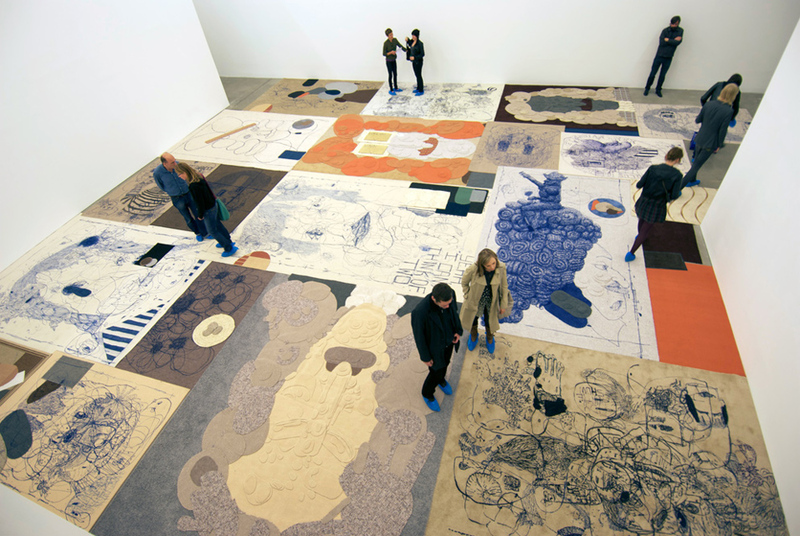 The scale of the rugs affects the physical relationship of the viewer to the work. I like the thought of people walking over my ideas, convoluted and preliminary as they often are, and examining and stepping over an intimate space while simultaneously feeling small. Like having the same relationship an insect would have to a drawing - or of course a child to a carpet," Lerma says. The Credentialist, created by José Lerma, is organized by CAM Raleigh. It is curated by Elysia Borowy-Reeder, executive director of CAM Raleigh and coordinated at CAM Raleigh by Kate Shafer, gallery and exhibitions manager and Evan Lightner, lead preparator.